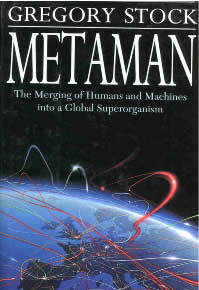 Metaman as a "physical entity" is the connectness of life in Hyperland: from the cattle, wheat, human diseases, human pests, forests, mines, rivers, ports, and mankind and his buildings and tools. This Vernadskian view, living matter and its products has extended the life in land (Hyperland) over life and non-life of the Earth as a dynamic functional structure. Bringing organisms, families, materials, machines, documents, and a mobile throbbing to the rich-barren, limited mobility of life in land, Hyperland. Stock, Gregory, MetaMan, Simon and Schuster, 1993. Bagehot, Walter, Lombard Street: Description of the Money Market, 1873. Weatherford, Jack, The History of Money, 1997. Ferguson, Niall, The Ascent of Money, 2008.